The Comfort Inn Fallsview is located in the heart of the fabulous Fallsview District, where you can actually feel the mist of the mighty Niagara Falls from your balcony. The Comfort Inn Fallsview is conveniently located across the street from the new Fallsview Casino Resort and only steps away from the Horseshoe Falls. The Comfort Inn Fallsview offers luxurious accommodations that including rooms with queen size beds, family units, Jacuzzi suites and adjoining rooms. The 107 luxurious brand new rooms contain queen size beds, remote control satellite TV, free in room movies, radios, hair dryers, coffee makers, data ports, wireless internet, 2 bedroom suites and some with private balconies. 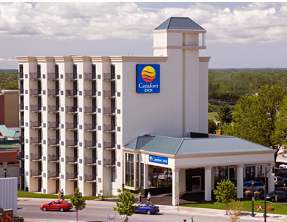 The Comfort Inn Fallsview Hotel is located in the popular Fallsview District of Niagara Falls, Ontario. This hotel is proud to provide guests with great accomodations at an affordable price; right in the heart of the action! Plan to enjoy a fantastic lunch or dinner with your family or friends at our world famous restaurant My Cousin Vinny’s Restaurant located on-site. This Niagara Falls Comfort Inn offers two large swimming pools, both indoor and outdoor, as well as giant Hot Tubs and an outdoor Sun Deck. Located only minutes from the popular Niagara Falls’s attractions, the Comfort Inn Fallsview’s great location provides convenience everybody can enjoy. My Cousin Vinny’s is an authentic Italian-American cuisine, with attentive service and great value. ‘Cause it’s all about celebrating that wonderful Italian-American culture and passion for food’. After a delicious meal, relax and enjoy fabulous entertainment that ranges from Latin to jazz. In the summer season, guests can enjoy a delicious meal al la fresco when the spacious outdoor terrace is open. Five time Trillium Award Winners for best patio in Niagara Falls, best gardens and best entertainment, this seasonal hot spot is a perennial favourite. At the incredibly popular All-You-Can-Eat Country Chalet Breakfast Buffet, guests can start the day with an all-you-can-eat buffet and a pot of fresh coffee. Rise, shine and enjoy the tasty selections as the kind and courteous staff keeps a watchful eye. In the summertime, guests are encouraged to take their breakfast amidst the blooming splendour of the patio garden.